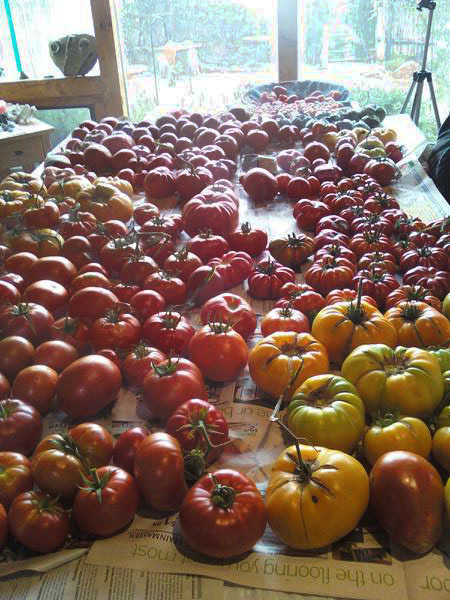 I’m finished with tomatoes for the year 2015! Finally this week there are no more tomatoes sitting around in the house! FINITO! NONE! DONE! Nice to see the kitchen table again! 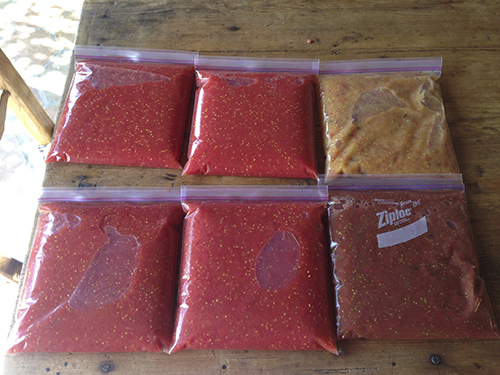 This week I made the last batch of tomato tapenade and the last batch of raw tomato sauce (24 frozen gallon bags of raw tomato sauce). Phew! 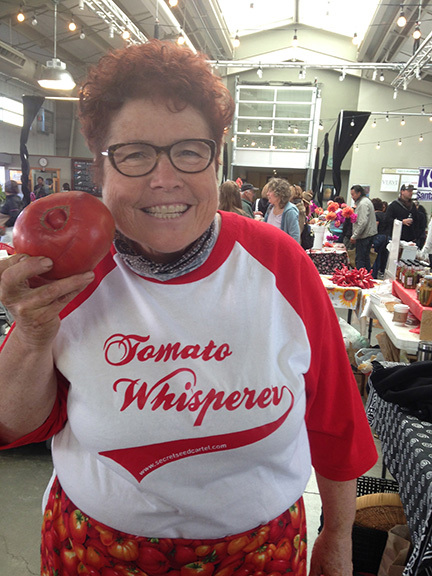 As a friend Deborah says, ‘That’s the part no one tells you about’-preserving your produce. It goes on and on and on for months. Soon before Christmas, I will have to can some spaghetti sauce from some of the bags of frozen sauce. But not now-I’m gonna take a week off! Fall harvest season is full blast right now! Harvest season is full blast right now. Started out with our Home Grown New Mexico ‘Jam On’ class where we made a Strawberry-balsamic jam and a terrific Blueberry jam. Then the grapes ripened-ate lots and dried some into raisins for later. The cucumbers ripened so fast I was making lots of pickles. First I made bread and butter pickles, then cornichon pickles and then dill pickles-crock, refrigerator and canned. Must have about 30 jars+ and now the 5 gallon crock is full where I am fermenting some with salt brine. After I was bored with pickles, I made some sweet pickle relish which I haven’t tasted yet. Will probably make more of that with the giant cucumbers I miss when looking for little ones. So far I’ve made pickles with Jody, Nick and Elodie. 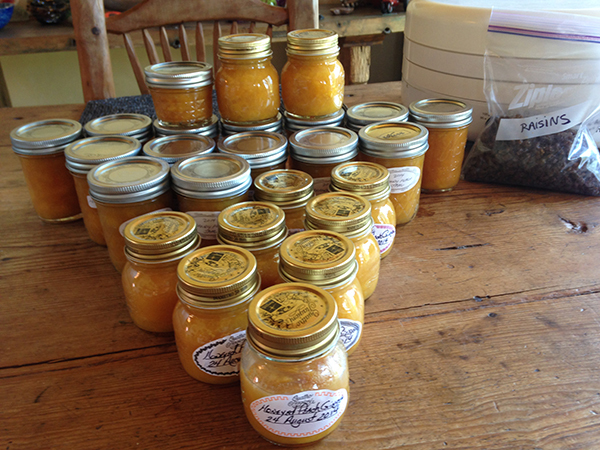 Then I bought 20 lbs of peaches from the Farmer’s Market and Mernie and I made 3 different peach jams. Now the tomatoes are coming in and I’m starting to make the raw tomato sauce that I freeze in gallon plastic freezer bags. Later in November after I recover from harvesting, I will take them out of the freezer and make different pasta sauces like puttenesca, marinara, penne alla vodka and good ole spaghetti sauce. Potatoes dug out just in the nick of time! Soon I will harvest potatoes too. and we will harvest honey from the bee hive. Of course then there is all I take to the Farmer’s Market that I harvest every week-tomatoes, eggplants, shishito peppers, beans, tomatillos and sometimes rhubarb, kale and chard when I have the room on the tables. Phew! Busy time of year! The best part of it all is I haven’t bought any vegetables in the store since early July and I’ll have a full pantry for winter when harvest season is done.